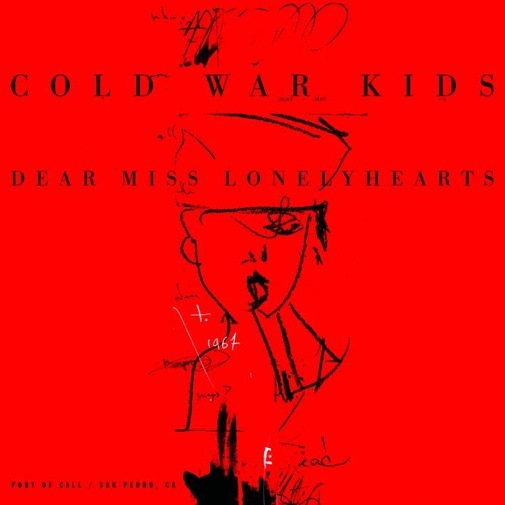 On Dear Miss Lonelyhearts Cold War Kids have dialled back the stadium chasing antics which made Mine Is Yours the biggest disappointment of 2011. Not that they have totally disregarded the need for a shakeup in sound. The ramshackle piano, beating on the walls and alley cat wailing which made their debut so exciting remain but now have a much sunnier gleam to them. 'Lost That Easy' features glitch synth and skitterish high-hat work giving the track a more danceable feel, the huge chorus of "I wanna see visions" is the only hint that they're taking themselves serious enough. Tracks like 'Miracle Mile', 'Bitter Poem' and 'Tuxedos' harbour the lyrical themes of old where Nathan Willett would tell grimy American tales of family, religion and politics, always skewing the moral compass. Opener 'Mircale Mile' also features the most catchy and chant-worthy phrases. 'Fear & Trembling' along with 'Bottled Affection' muddles along hiding a lack of imagination lyrically and musically. While the sound of the band tries to keep up with the times the melody and the lyrics suffer. A driving bassline in 'Jailbirds' along with the intelligent chorus of "Father make believe for your daughters, mothers take it easy on your sons" make it a standout track, highlighting how they might yet keep old fans happy and reel in new ones. By the time you reach 'Water & Power' the realisation hits that the reason this album seems to pull in two directions is that the production decisions are a little off. Nathan Willett's voice is covered in a long reverb more suited to an R&B diva than a DIY indie rock band; and when it isn't his voice is often drowned out by echoing synths and choral lines. Not quite the horrific cash-in of Mine Is Yours then, but still a way off their old form. Their own influence rather than others pays more dividends and it's a lesson they will hopefully fully realise by the next album.